Great, unique and exclusive, the offer is as versatile as water. For those who seek a unique location for an exceptional occasion, Aquaria Thermal SPA is the perfect setting. 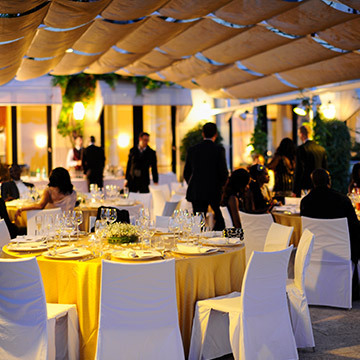 With reserved access and close to the outside, more than 10,000 square metres of park and thermal areas will be available to prepare and personalise weddings and important birthdays and companies can express their identity, objectives and success to the utmost. 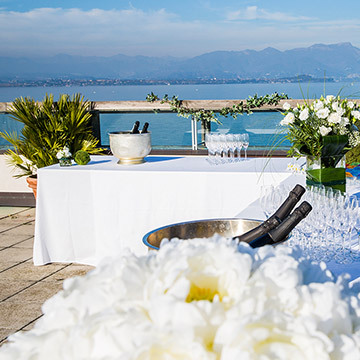 In an evocative atmosphere, where the water is the predominant element, an artificial scenic effect created ad hoc by event planners alternates with the unique panorama of Lake Garda, which, after the magic of sunset, presents plays of light and unforgettable colours. As with all events, dress is important and exclusive Aquaria is the perfect location both for relaxing events, where you can be embraced by the softness of our bathrobes and be scintillating in evening dress for parties.